DE-MS/-BR/-TBK Black DE-MS MONOSHOCK RAM The flagship of the Dynamic Entry tool line Expert breacher's ram of choice Non-sparking and electrically non-conductive to 100,000 voltsAC Semi-flex handle system absorbs most of the impact stress Unique design allows for maximum force from a lighter weight tool. DE-BR BREAK -N- RAKE Specifically engineered for window entries Head constructed of carbon steel Reinforced laser cut hook effectively removes curtains, blinds and other obstructions,Serrated blade aids in removing glass and window tines Three 12 raking fins designed to clear glass and other debris left in the window frame D-Handle system is electrically non-conductive to 100,000 volts AC. 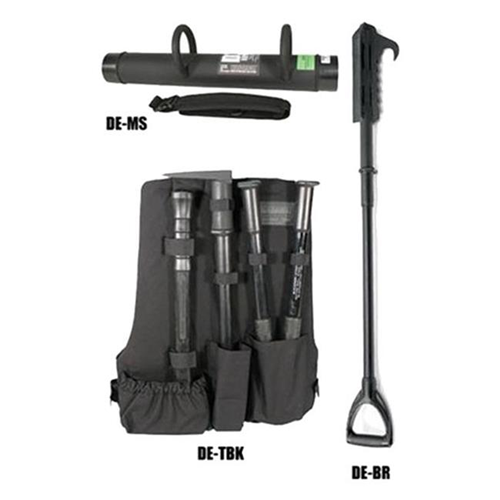 DE-TBK TACTICAL BACKPACK KIT (INCL. DE-SOHT, DE-TM, DE-BM AND 60ME00BK) The standard for most breaching operations Features a Boltmaster, a choice of either a Thundermaul or Mini ThunderSledge, and a Spec. Op. Hallagan Tool orSpec. Op.